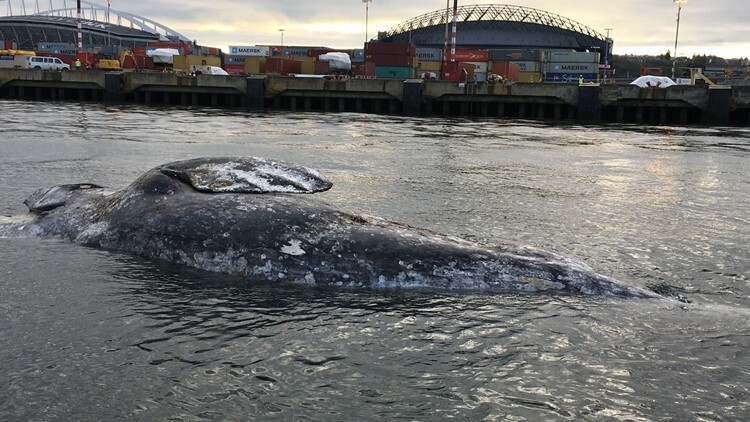 A juvenile gray whale has been found dead at the Coast Guard Pier in Elliot Bay. Crews with the Washington State Department of Fish and Wildlife towed the whale toward Whidbey Island where Cascadia Research Collective scientists will perform a necropsy Monday afternoon. The 25-foot whale appeared skinny, according to NOAA Fisheries spokesperson Michael Milstein. Surveys in one of the main Baja lagoons has found about half of the individual whales to be skinny and malnourished. Skinny whales have also been seen in San Francisco Bay. Six gray whales have been stranded in Washington so far this year. At least one of those whales was necropsied and found to be emaciated.